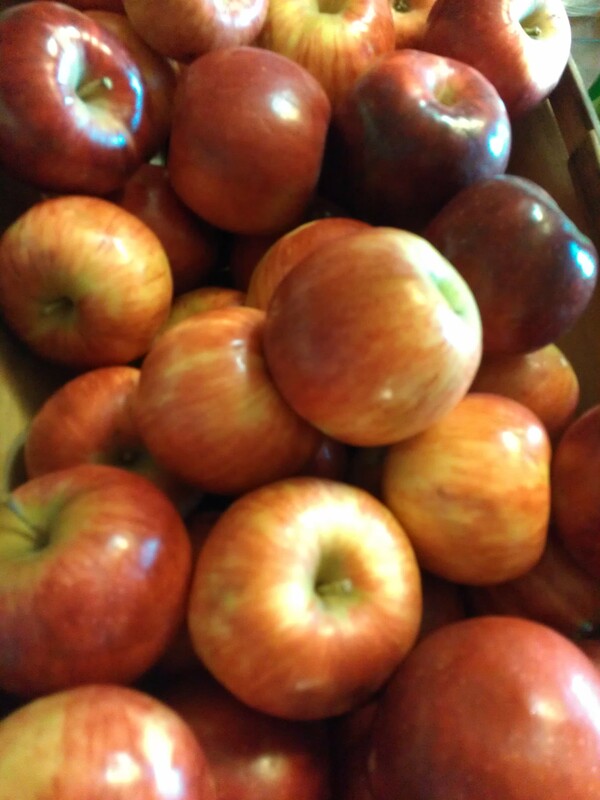 Today I am thankful that the bushel of apples is finally down to one single trug full. I am thankful that we made a spicy apple pie, six pints of apple pie filling, and over nine pints of apple butter. I am thankful I made this Apple Marmalade. Apple marmalade, you ask? Never heard of such a thing? Well, you should be. This stuff is gold. Stupendous. Magnificent. This recipe comes from that beloved Ball Complete Book of Home Preserving that my mom got me for an early birthday present this past summer. I have used it and used it and used it. Everything we have made out of it has been delicious (with perhaps the exception of the Chunky Mustard Pickles which look like they’re canned in lemon curd). Lately, I have been trying not to publish recipes from cookbooks unless I have made significant changes to them. This recipe, however, must be shared with the masses. In a stainless steel kettle, combine apples, water and lemon juice. Bring to a boil over high heat, stirring often. Reduce heat, cover and boil gently, stirring occasionally, for 10 minutes. Removed from heat and whisk in powdered pectin until pectin is dissolved. Return to high heat and bring to a boil, stirring frequently. 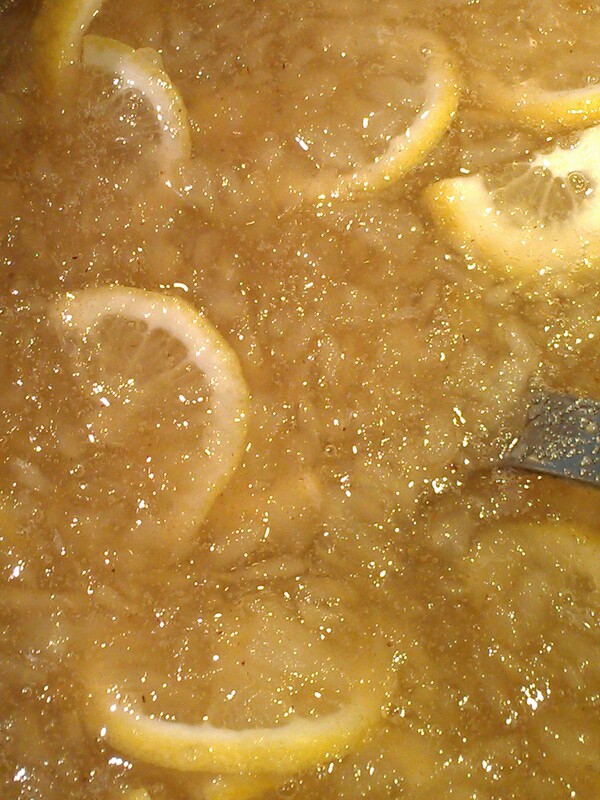 Add lemon slices, sugar and nutmeg. Return to a full rolling boil, stirring constantly. Boil hard, stirring constantly, for 1 minute. Remove from heat and skim off foam if necessary. Ladle hot mixture into hot sterilized jars, leaving 1/4 inch headspace. Wipe rims, place on lids, and tighten bands. Place jars in canner, ensuring they are completely covered with water (about 1 inch). Bring to a boil and process 10 minutes. Remove canner lid and wait 5 minutes to remove jars. 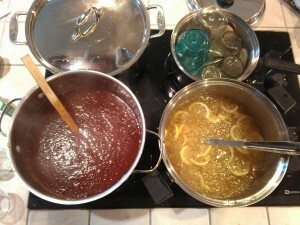 Yes, I know that this is not a true marmalade recipe, but you will be fooled. The Ball Complete Book of Home Preserving suggests you spoon this golden deliciousness into baked mini-tart shells for mini-desserts. What a great idea for a holiday dessert buffet. I had two huge pots cooking of luscious apple goodness one weekend. Grandma’s Apple Butter on the left and Apple Marmalade on the right. We haven’t tried tarts yet but this marmalade can’t be beat on a warm-from-the-oven roll with butter. Total aside: We could not have made it through our apple preserving quest without this little gadget. This crazy looking device peels, cores and slices with just a turn (or two or three) of the handle. It is remarkable. 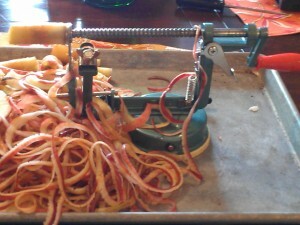 I am thankful for this apple peeler. And sincerely, I am thankful that we are spending the day with family. I hope you are doing the same. 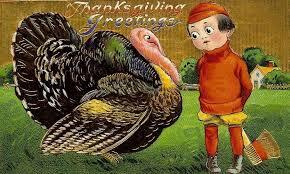 Have a lovely Thanksgiving with family and friends! I have been making lots of applesauce and applebutter lately…my MIL has the same apple peeler. It’s quite practical when you need to peel tons of apples. Couldn’t have done it without the gadget. I could use this marmalade in so many ways… Love this gadget! Is it old? Or are there similar ones out there and I just haven’t noticed? Mom got this for me. I am sure it wasn’t new. LOL. I think they’re new ones out there. I really scoffed at it when I first gor it, but I couldn’t live without it now. Hope you had a wonderful Thanksgiving! What a great apple peeling gadget you have and apple marmalade on a warm roll sounds good on those cooler nights. It was great on warm Thanksgiving rolls! Wow this marmalade makes me happy! Wouldn’t mind trying it on toast soon! How fun! I love the idea of apple marmalade. I can think of a zillion ways to use it, pinned! I can just imagine what is working through your brain right now, Chris….